Deep powder skiing with Olympic Gold Medalist Jonny Moseley at Squaw Valley USA, located in Olympic Valley, California, was about as good as it gets, and the season was still young. Squaw Valley USA is conveniently located 42 miles west of the Reno/Tahoe International Airport, 200 miles east of San Francisco, and 100 miles east of Sacramento. Growing up skiing on the east coast of the United States where the conditions were often less than stellar, we dreamed of one day skiing "out west" where we had heard about "deep powder snow" on the slopes. 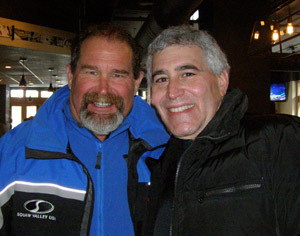 In late February 2012, a leap year, the Adventure Kids aka Debra C. Argen and Edward F. Nesta finally took the leap and headed west to Squaw Valley USA, home of the 1960 Winter Olympics, Olympic Gold Medalist Jonny Moseley's playground, and 4,000 acres of world-famous ski terrain to experience "deep powder snow." 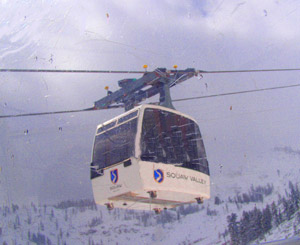 The 2010-2011 ski season at Squaw Valley had epic levels of snow (depositing over 750 inches, double the normal amount), with skiing available through July 4, 2011, however the 2011-2012 season was off to a very slow start. 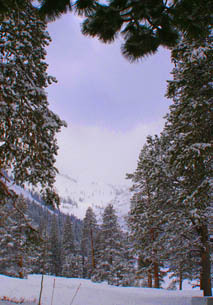 Like everywhere else in the United States, winter although a date on the calendar, had not reached the Sierra Nevada mountain peaks with the usual vast amounts of snow. In fact, the last year that the region had so little snow was in 1879. That however, changed on the day that we arrived at the Reno/Tahoe International Airport. The snow had begun earlier in the day and we were welcomed at the airport by a deep blanket of snow on the ground, and the snow kept on falling heavily. 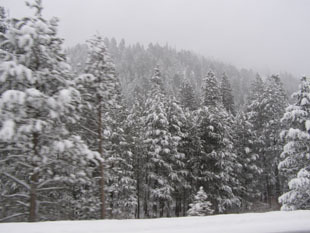 Sitting back in the comfort of our chauffeured limo with our destination the Resort at Squaw Creek, we looked out the car windows and watched the tall stately pines standing like silent sentinels shrouded in snow and fog, with snow falling so fine that it appeared almost cloud-like, instead of as singular miracles of nature. 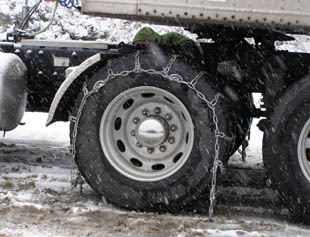 We passed checkpoints where cars without 4-wheel drive and trucks were required to put chains on their tires for the climb up the mountain, and by the time that we reached the town of Truckee, where the elevation was higher and colder, there was even more snow. The adventure was just beginning! 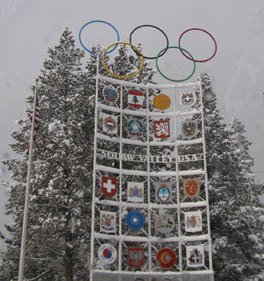 It was slow going, but when we finally arrived at the entranceway of the Resort at Squaw Creek and passed the Olympic Torches that commemorate the 1960 Winter Olympics, it was a definite thrill, and the sun had broken out of the clouds as if to welcome us. During the night, the snow continued falling, ultimately accumulating over 2 feet of snow by daybreak, and the snow just kept on coming. This is what we were waiting to experience; this is why we had traveled out west to ski deep powder snow! We arrived early to pick-up our rental ski equipment from the on-property Squaw Creek Sports, new Solomon High Performance boots and Atomic Affinity Storm skis (for Debra), and Solomon High Performance boots and Atomic Smoke skis (for Edward), and eagerly looked forward to our day of skiing. Debra's Ski Day: Staying at the Resort at Squaw Creek, we could see the Squaw Creek chair lift from the bay window of our suite, and our adrenaline started pumping as we watched the snow steadily falling. As our skiing levels vary, Edward and I parted ways for the morning; he for a ski lesson with Squaw Valley Ski School Instructor Michael Fenton, with a rendezvous point set for lunch at noon at Rocker at Squaw, located in The Village at Squaw Valley, which consists of interesting shops and restaurants, perfect for a leisurely break between or after a day skiing or riding. 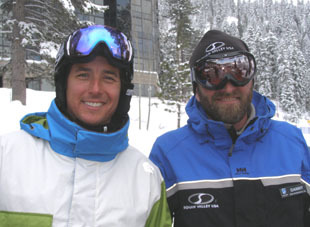 Me, to spend my morning skiing with Olympic Gold Medalist Jonny Moseley, part of Squaw Valley's unique program that provides a small group of skiers and riders with the opportunity to spend a few hours touring the mountain with Jonny on set dates over the season. As I was new to deep powder skiing, I was also happy to have Squaw Valley Ski School Instructor Danny Sullivan skiing with our small group to keep me on track and teach me deep powder techniques. 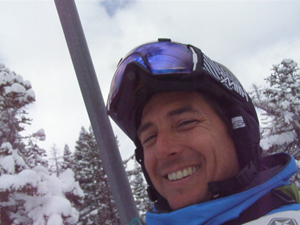 Jonny Moseley and Danny Sullivan arrived with welcoming smiles, introductions to the group over, helmets and goggles donned, skis on our feet, poles in hand, we boarded the Resort at Squaw Creek's triple chair lift. We arrived at the top at Snow King, elevation 7,550 ft/2,301 m, the snow still falling, the morning alternately grey and foggy with patches of sun occasionally breaking through the clouds, and Jonny was off like a lightning bolt with the group and me trailing behind him trying to keep up, and Danny watching my back, as we toured "Jonny's mountain" on the first run of the day. Riding the chair lift back up again, I interviewed Jonny about what it was like growing up and skiing at Squaw Valley. Jonny replied, "Squaw Valley is where I grew up skiing. I represent the weekend warrior; my older brothers, my parents, and I would pile into the car on Friday nights and I learned to ski right here from an instructor who is still here." "My parents put me into the Mighty Mites program, for 4, 5, and 6 year olds; there were only 8 in the program at the time, now it is something like 600. It has grown as it is a good program and has turned out really great skiers like Julie Mancuso and a bunch of others. Anyway, we were alpine skiers and racers and then my brothers and I saw "Hotdog" the movie, and although not critically acclaimed, I loved it. My older brother really loved it and signed us up for the freestyle team the next day. My dad was like, "great," he just wanted us to have a good time and be involved in something productive. One thing lead to another, my brothers were good freestylers as well and we started winning races here and there, and I started to become obsessed with it, and so did my older brother, Rick. We had some great coaches here who encouraged us and became great mentors as well, and we started traveling around and competing and winning. Next thing you know, my brothers and I were winning NorAms, and I won Junior Nationals and a World Cup. I put together an Olympic campaign and won World Cup and the Olympics, and just sort of made a career of it." To listen to the full interview with Jonny Moseley, visit Luxury Experience's Facebook page at www.Facebook.con/LuxuryExperience. "Eventually, I always wanted to come back here and sort of be the guy that represents the mountain and I was always telling people how great it was and how I loved this place, but it did not work out at the beginning. I represented a company that owned a bunch of mountains on the east coast and traveled around. Finally (Squaw Valley) came to their senses, and I came back, and I am now the spokesperson. My job is basically to ski around with people, which I love; I do that during the holidays and have a great time doing it. I sort of help promote the mountain all over the world." "Now it has become this great project; the new owners have really done a great job in the Village at Squaw Valley and bought the neighboring mountain, Alpine Meadows, which is great to ski. I love showing people around like you. I have my own run named after me, "Jonny Moseley's" run." At this point I inquired if we were going to ski that, to which he replied, "Yeah, if you can handle that! It is one of the harder runs on the mountain." With that I think, yeah, perhaps next time, or perhaps maybe in another lifetime. As for the first run we made, he replied that we had skied, the Resort Run at Squaw Creek. "The chair lift was added when the hotel was built in the 1990s and we always looked at the terrain back here as being great terrain and it has proven to be; it has really nice intermediate groomers but then also some of the rowdiest and steepest powder lines on the mountain." With that, we concluded the interview, pushed off the chair lift and Jonny lead us on a tour that took us all over that gorgeously scenic mountain, riding the chair lifts and the Funitel to ski and experience as much as we could. Heavy snowfall, oftentimes limited visibility, and skiing through the snow canons blasting snow into my face as we cut across the trails, had my heart pounding with excitement. This is what real skiing is all about, skiing in all weather conditions, and loving every minute of it. Of course it helped that I was skiing with Jonny Moseley, the other adventurous members of our group, and Danny Sullivan, who kept pushing me all morning to do my best. As the morning progressed, and the snow steadily got deeper, Danny Sullivan suggested that we go off from the group for awhile and find some deep powder to play in. 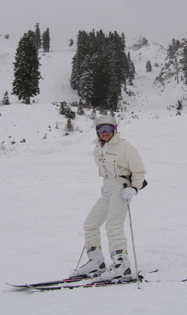 Eager to discover the secret of skiing in deep powder, I was ready to try it. For those unfamiliar with skiing deep powder, let me explain. No matter how long you have been skiing, deep powder is a completely new and different experience. Growing up skiing on packed powder, corn snow, corduroy, crust, slush, and often ice, I knew how to find my balance under those conditions, where to place my skis and poles, how to dig my edges in as I cut my way down the mountain, and the proper weight distribution on my skis. When I tried skiing in deep powder I soon learned that I had to throw all of my conditioned reflexes out the proverbial window if I was to stay upright on my skis and moving down the mountain. Skiing in a yet un-groomed area, when Danny came to a stop, our skis were suddenly submerged in 2 feet of pristine snow that was extremely dry, fine, fluffy, and light as a feather, what they call "champagne powder." Looking at Danny and my sunken skis, my immediate thought was, okay, now what do we do? Pick up my left ski, do a kick-turn, and get my skis parallel to the mountain and learn how to ski deep powder, was the obvious answer. 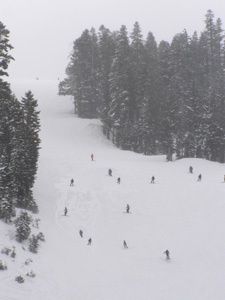 Skiing in deep powder requires the use of different techniques, for starters you cannot lean too far backward in your skis, nor too far forward or your ski tips will get bogged down in the snow, and your weight must be evenly distributed over both skis to glide over the snow opposed to the usual shifting of one's weight one traversing on packed powder. Stopping suddenly or drastically shifting your weight from one leg to another may result in losing your balance and leaving a "sitzmark" (a reminder that you fell) in the snow. The secret no one tells you though is that skiing in deep powder is hard work and even harder to get up if you fall. However, the feeling of being a pioneer as well as the beauty of skiing through a fresh blanket of snow where no one has yet skied was well worth it. We gradually made our way through the deep snow to a trail in the woods that took us between the trees where we were sheltered from the pelting winds and the continually falling snow, and it was breathtakingly beautiful. Little by little I adjusted to the new technique, and learned to bounce a bit in my skis to feel the mountain as the visibility grew progressively worse. Stopping for a bit of a break, Danny pointed out Jonny Moseley's run, and I looked up at that steep terrain laden with trees, and remembered Jonny saying that it was one of the hardest runs at Squaw Valley. It was technical skiing at its best, daunting and challenging at the very least, and I was very happy to have seen it, from a distance. That was one run that I would definitely not be skiing on this trip. We skied hard, discovering the mountain's secrets, taking time to enjoy the beautiful scenery as Danny pointed out the some of the mountain peaks including Granite Chief, majestic and intimidating at an elevation of 9,050 ft/2,758 m), KT-22 (elevation 8,200 ft/2,499 m), and Emigrant (elevation 8,700 ft/2,652 m), and the pure adrenaline rush that comes from challenging oneself to do your very best. Although it had been a long wait to ski deep powder, the wait was definitely worth it; I am now hooked on California skiing at Squaw Valley. After an incredibly exhilarating morning, followed by a great lunch at Rocker at Squaw where Edward and I compared skiing notes and chatted with Jonny, Danny, Michael, and our new friends in our ski group, it was time for me to hit the slopes again. 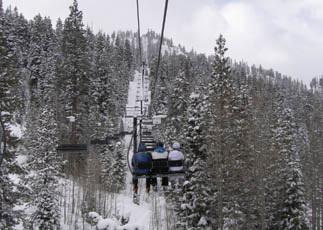 Danny Sullivan and I hopped on the Red Dog chair lift opposite the restaurant and rode it up to Snow King, where we skied down the run, Lake View, which took us directly back to the Resort at Squaw Creek just in time for my Spa appointment at the Spa at Squaw Creek. Now that is what I call an exceptional and most memorable day of skiing. Edward's Ski Day: I am always excited to hit the slopes. Each time I have ventured onto the white stuff, I have learned something new, and with the excitement of the fresh powder on the slopes, I was ready to go. I joined up with my tour guide and instructor, Michael Fenton and we ventured over to the Pulse Gondola for our ride up the mountain. As we rode up, Michael talked about balance and letting the skis do all the work so we could enjoy the beauty of the mountain. With Michael, it is all about balance and focus, which I readily concurred. We exited the gondola, stepped into our skies and I was ready to hit the slopes, figuratively speaking. We started with wedge skiing, which has always been a weakness of my skiing technique; have a dominate right foot and my left foot does not respond as needed. I have no problem using the wedge for slowing down and stopping, but my feet do not work well in this format for traversing the slopes, but I listened to Michael and worked on this technique. 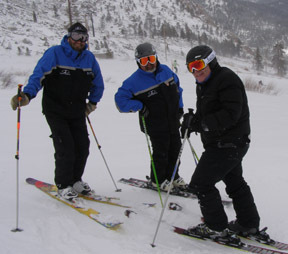 I switched between the wedge and parallel skiing and I was able to traverse the mountain while I kept my eyes forward so I could see where Michael was as well as enjoy the breathtaking scenery of Squaw Valley. Michael had me on the lower half of the mountain, which was well groomed and we only came upon small sections of powder. 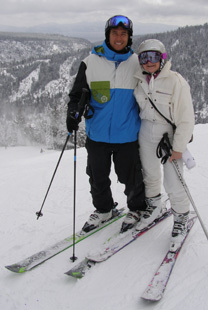 I did hit the slopes a few times, and started to get my ski-legs back so I could really enjoy the day. 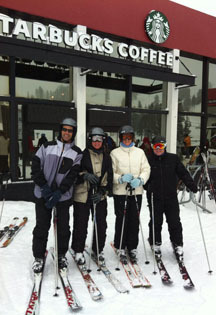 We stopped to enjoy the world's first and only Ski-in/Ski-out Starbucks, new for the 2011/2012 season, for coffee diehards who want to have their caffeine without having to remove their skis or snowboards. After a fun morning of learning and skiing, we caught up with Debra at Rocker@Squaw for lunch (see Rocker at Squaw in the Restaurants section). 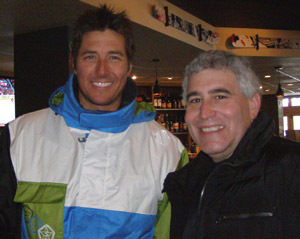 We swapped stories over lunch and I had the opportunity to meet Jonny Moseley. After lunch at Rocker@Squaw, I went out for a couple more hours of fun on the slopes with Michael as we tried some new areas and some new techniques. By now, the snow had stopped falling and the slopes were ready for me to attack and enjoy. Then the winds picked up and we ran into a few whiteouts on the trails where we stopped until the visibility improved before venturing down. It felt surreal being a part of the mountain as Mother Nature did its thing and smoothed out the new snow across the trails; it was truly a once in a lifetime experience for me. After 3 hours of skiing in the morning and 2 more hours in the afternoon, I was ready for my much-needed Spa appointment at the Spa at Squaw Creek. Pushing my time on the slopes, I did not leave myself adequate time to drop my boots and ski clothes off in my suite, so I figured if the Resort at Squaw Creek is a Ski-in/Ski-out facility, then so is the Spa at Squaw Creek. I jumped off the lift, returned my skis to the shop for the night, and went straight to my Spa appointment still outfitted in my ski boots, bibs, jacket, helmet, and all, and boy was I ready for a massage. Squaw Valley USA is open Weekends and Holidays from 8:30 am until 4:00 pm, Weekdays from 9:00 am until 4:00 pm, and offers Night Skiing from 4:00 pm until 9:00 pm from mid-December until mid-April. New for 2011-2012, Squaw Valley and Alpine Meadows Ski Resort are now owned by the same company to maximize your ski and ride experience with one season pass, lift ticket, or The Tahoe Super Pass valid at both facilities, providing access to over 6,000 skiable acres, 43 lifts, and over 270 trails spread across eight Sierra Nevada mountain peaks. To maximize ease at skiing or riding at both facilities, the Squaw Alpine Express is conveniently offered on a regular basis between Alpine Meadows and Squaw Valley. Off-site shuttles to and from North Lake Tahoe, Reno, and South Shore are also offered. For additional information on Squaw Valley USA, please visit the website: www.Squaw.com. 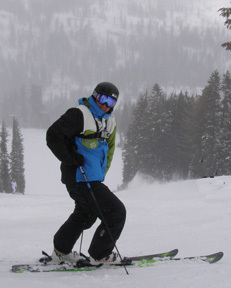 For additional information on Alpine Meadows Ski Resort, please visit the website: www.SkiAlpine.com. 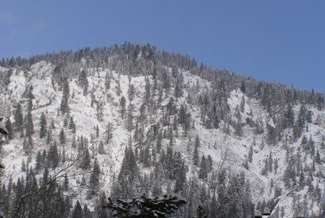 For information on the Resort at Squaw Peak, please visit the website: www.SquawCreek.com. 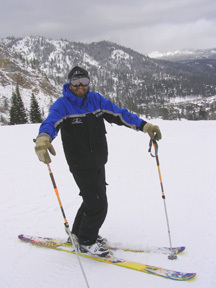 Read about skiing at Alpine Meadows Ski Resort in the Adventures section. Squaw Valley USA is conveniently located 42 miles west of the Reno/Tahoe International Airport, 200 miles east of San Francisco, and 100 miles east of Sacramento. Read more about the Resort at Squaw Creek in the Destinations, Hotels and Resorts, Restaurants: Six Peaks Grille, Restaurants: Rocker at Squaw, Chefs' Recipes, Spas, and Adventures sections.